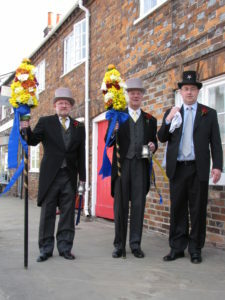 Hocktide – the most important day in the life of the Town and Manor – always takes place on the second Tuesday after Easter. 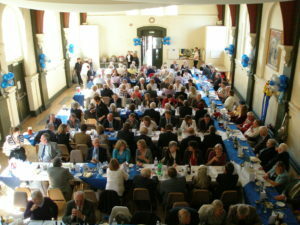 There are many other events and activities that are related to Hocktide itself. Mar 29th (Tue) 6.00pm Town Hall – Selection of Hocktide Jury: (Private – for all Commoners). The presence of all Commoners is requested. Those selected that evening for the jury, will be issued with a summons as jurors to attend the Hocktide Court on Tuesday. Apr 3rd (Sun) 10.00am Common Clear-up: All Commoners and friends wishing to assist with the Commons Clear-up please meet at the Downgate at 10.00am. Apr 4th (Mon) 7.30pm Corn Exchange – Ale Tasting: (By invitation only). The Ale Tasters will carry out their onerous task of testing and declaring on the quality of the ale. Entry is by invitation only. 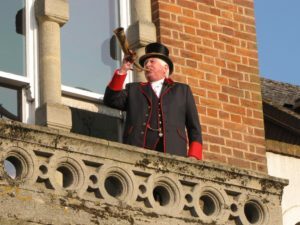 8.00am, Town Hall Balcony – Summoning of all Commoners to Hocktide Court: The Bellman will sound the Constable’s horn from the Town Hall balcony. 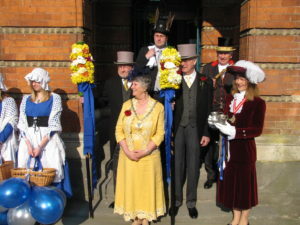 All commoners will be summoned by the bell and proclamation to attend the Hocktide Court. 9.00am, Town Hall steps – Tithing Men set off: The Constable will present the Tutti Poles, which have been decorated by Fiona Hobson, to the Tithing Men. Then, accompanied by the Orangeman Paul Lewington, and the Tuttigirls, they will set off to collect the dues from the Common Right properties. 9.05am, Town Hall – Hocktide Court: The selected Hocktide Jury will attend and all commoners are called. Spectators are welcome to watch and listen to this very old tradition. Tickets to attend this traditional highlight of the town’s year are available to purchase from Crown Needlework, 115 High Street, Hungerford (01488 684011). The lunch is a four course meal with various toasts. Commoners and Trustees: Tickets are available from 18th March. You are entitled to buy your own ticket (limited to one ticket only) at £30.00, and your partner’s ticket (again limited to one ticket only) at £35.00 provided that they are both paid for by the 7th March. All other tickets will be available at £36.00 from the 8th March on a first-come first-served basis. Please note: If you wish to pay by credit card there will be an admin charge of £1.00 per ticket. Before lunch – The Bar will be open at 12.00 noon to enable you to buy your wine by the bottle and soft drinks for lunch. A complimentary glass of wine before the lunch will be provided for you and your guests in the Magistrates Room. The lunch – commences promptly at 1.00pm, so please be seated by 12.50pm to receive the Constable and her guests. Be ready to receive the Tithing Men and the Orangeman when they join us for lunch. Shoeing the Colts – After lunch the Blacksmiths will proceed with the shoeing of the colts. Please explain to your guests that although this is traditional, it is carried out light heartedly and no one should be hurt. A little struggle makes it all the more fun, but they can be shod gracefully if they so wish. A small charge of £5.00 is made to cover the cost of the souvenir horseshoe. From 5.00pm, The Three Swans Hotel – Anchovies on Toast: All are welcome across the road for the traditional anchovies on toast, courtesy of the Three Swans. 7.30pm, Corn Exchange: Hungerford Town Band will play for the pleasure of the people of Hungerford. (Free admission). 9.00pm, The Three Swans Hotel – Return of the Tithing Men: The last port of call for the Tithing Men is the Three Swans Hotel at approximately 9.00pm. Everyone is encouraged to join the Constable and welcome them safely back at the end of their long and arduous day. 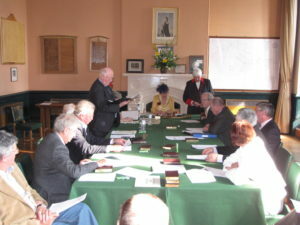 April 8th (Fri), 11.00am, Town Hall – Court Leet: The Court will be in session for all Office Holders elected at the Hocktide Court to be sworn in. April 10th (Sun) 10.45am – Constable’s Sunday. 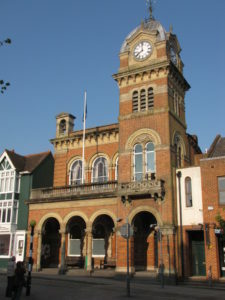 Outside of Town Hall: The parade of the Commoners, Trustees and various organisations from the town will assemble outside the Town Hall to march, with the Constable for the ensuing year, to the Parish Church. The Bellman will organise the procession which will be led by the Hungerford Town Band. 11.15 a.m. St Lawrence’s Church – The Croft: Alternatively, you may meet us at the Church. There, we will gather together for a service to celebrate the life of the Community of Hungerford.